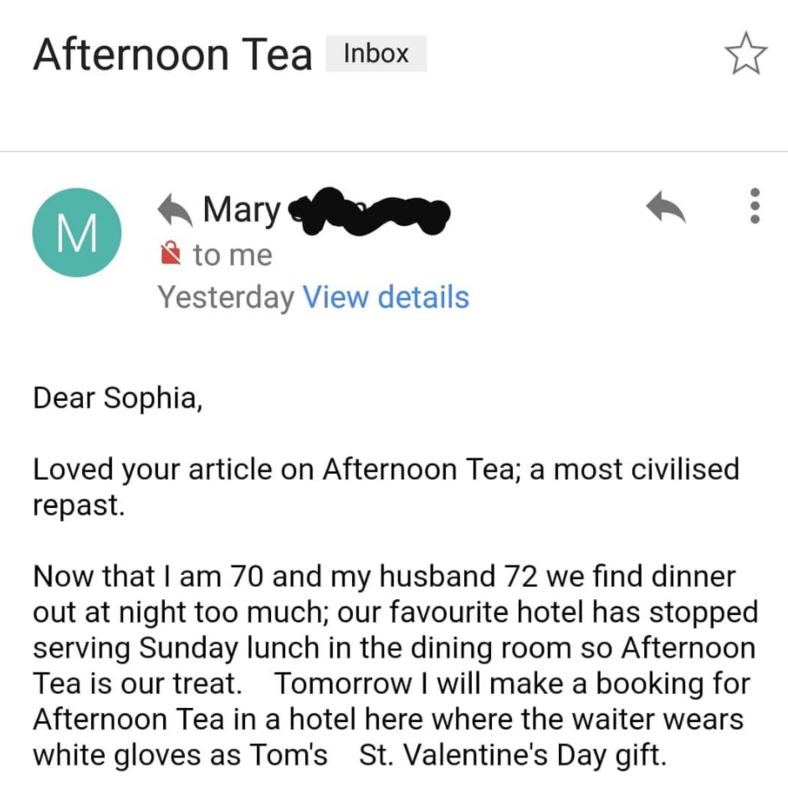 Sunday’s column below, which relates to the screen-grab also below from a very sweet email I received on Sunday evening from a women called Mary who lives in Ireland. I’ve half a mind to crash their romantic tea (HATE Valentine’s Day, am dreading Valentine’s Day with every fibre of my being), but I’d better not. OH, also, I saw the paperback cover of The Plus One this week which is HEAVEN and am going to reveal next week (ahead of paperback publication on April 18th, so excellent timing for the Easter holidays when you’ll want something jolly to read while you hide from kids smacked up on sugar). I also saw the French cover of the book which is incredibly charming (charmant?) but can’t reveal that until late March. So hopefully you can all hang on until then. I never met the 7th Duchess of Bedford but I feel certain we would have been friends. Alas she died in 1857. Portraits show a pale-skinned woman with a fondness for feathery hats, but she looks slight for one who invented the afternoon habit of teatime. It was Anna (she would have liked me to called her Anna) who complained in 1840 of a ‘sinking feeling’ every day at 4pm. I am no doctor but I suspect it’s the same ‘sinking feeling’ that propels me to the corner shop for a Twirl at a similar hour. Anna was peckish, but supper was still an agonizing distance away, held at 8pm. To remedy this, Anna asked a servant to carry a tray of Darjeeling tea, bread and butter and cake to her room every afternoon. Teatime was born. Anna’s friends started dropping in for tea and cake and it became a social event in her private room. Sometimes there were sandwiches since the Earl of Sandwich had the radical idea of putting a filling between two slices of bread a few decades earlier. Don’t say the aristocracy never did anything for you. 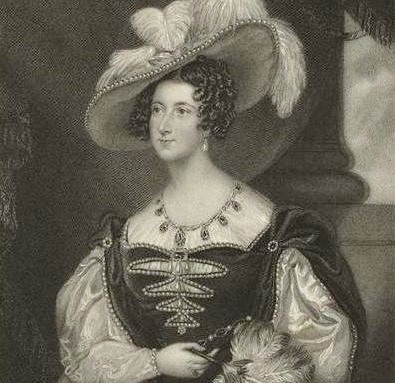 Anna was a lady-in-waiting to Queen Victoria, a useful patron and another woman who wasn’t shy of a bit of cake, and so teatime developed rapidly and became fashionable among toffs. English silversmiths, linen makers and china manufacturers started churning out elaborate fripperies for the table – sugar bowls, cream jugs, Herend cups and saucers, lace tablecloths. The food became grander. Mrs Beeton recommended a menu that included foie gras and cress sandwiches, tongue sandwiches, cucumber sandwiches, bread and butter, Madeira cake, plum cake, Almond cake, crystallised fruits, petit fours, sweet biscuits, tea, coffee, claret and sherry. It makes my daily Twirl habit feel quite abstemious. I only mention this because of Meghan Markle’s tea. 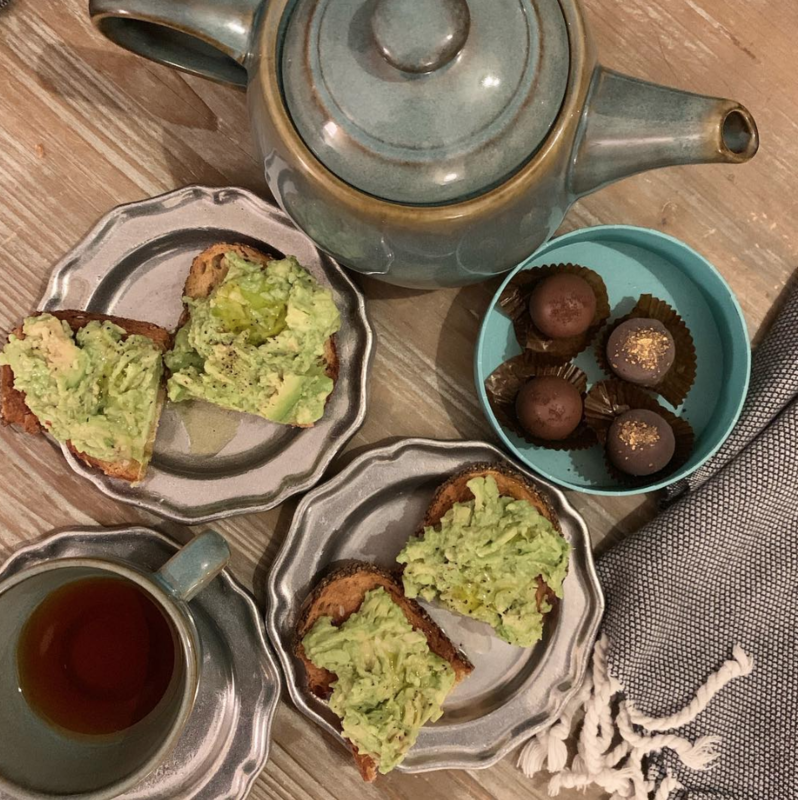 A make-up artist called Daniel dropped in on Kensington Palace last weekend and Instagrammed a photograph of their table which caused uproar – there was a pot of tea but no milk, four bits of toast spread with gunky avocado and four chocolate truffles. Needless to say, the Soho Home teacups have since sold out and one newspaper has criticised the Duchess for swallowing a tea-time snack that could be fueling murder and drought in Mexico, such is the demand for avocados. I have no intel on the avocado situation in South America and I don’t care what cups she drinks her tea from. But I do think Meghan should try harder with her teatime spread. Ok, the truffles were from Sandringham. Points for tactfulness. But I do think, at a time when she’s been subject to press snarkiness and gossip, it would do no harm at all to be less Californian about tea. Chuck a Victorian sponge into the picture. Maybe a few crumpets. Find a jar of sticky, homemade jam and line that up next to the plate of Garibaldis. There needs to be milk, there needs to be butter. My mother still winces whenever she talks of the time I was three and not allowed to eat any chocolate cake until I’d finished my bread and butter. Apparently I sat at the table, tears rolling down my cheeks as I chomped my way through the Hovis. It was hardly conscription, but I feel it’s informed my character and that Anna, Duchess of Bedford, would have approved. Teatime is a fundamental tenet of Britishness. Meghan must embrace it. She needs to try a tongue sandwich. A male friend in his early 20s tells me he’s taken Eton off his CV. He’s applying for jobs in London and said mentioning his school is ‘too loaded’ and comes with ‘too many connotations.’ (So that’s £100k well spent by his parents.) Then came this week’s news that Hasan Patel, a bright 16-year-old from an East London council estate, has won a £76,000 bursary to Eton. Hasan’s a Corbyn supporter who announced his news online, only to be immediately slammed as ‘a champagne socialist.’ He’s since had to take a few days off Twitter, saying the abuse is so tiring he needs a rest. The poor guy’s 16! I know for some it’s tempting to blame Brexit and every other ill in the country on the most controversial school in the world, but let’s not continually penalise blameless young minds we may need to help sort this mess out in the future. Finally, an apology. I went to a dinner party on the weekend and observed a 30-year-old chap who kept leaping to his feet as if he’d sat on a pin-cushion whenever a woman came into the room. I noticed him because there are few men under 40 who do that these days. People will scoff at such old-fashioned chivalry, but there was something wholly charming about it. According to a BBC survey I found which dates from 2002, ‘most’ of the 1000 people asked about standing up declared it a ‘ridiculous’ habit. Seventeen years on, I imagine even more would slam it as archaic. Some people would presumably claim jumping to one’s feet is a patriarchal tool designed to intimidate women, to make us slosh our gin and tonics over the side in surprise. Nonsense. It’s a silent gesture which takes all of a few seconds before everyone sits down again. Sorry, sisterhood, I liked it.